and many other airborne & surface contaminants, allergens, and odours! The AirGuardian-Angel features Plasmacluster ION technology that releases oppositely charged hydrogen and oxygen ions into the air which combine to deactivate airborne and surface based contaminants. The internal fan ensures that the ions are sufficiently spread around the room. 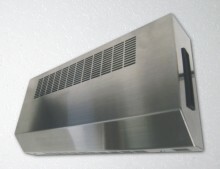 In addition, a removable compartment houses the odour control sachet which produces Cl02 vapour to combat odour. *99.9% effective on adhering H1N1 swine flu virus, 99.9% effective on suspended airborne H5N1 avian influenza virus (Verified in collaboration with Retroscreen Virology Ltd.).